If you are the owner of a child care center, your number one priority is the health and safety of the children that you care for and the employees who work for you. There are a number of services that enable you to run a successful facility, including integrated pest management and bed bug inspections. In today’s post, we will review a few tips that can help you avoid bed bug infestations in your care center. Read on to learn more, then call Advanced K9 Bed Bug Seekers to schedule your bed bug detection appointment! Adult bed bugs are small insects that are about ¼ inch long. They are reddish brown in color and may be oval or round. They can scurry quickly, and nest in places closest to where their human hosts sleep, including in mattress folds and bedding, wall cavities, baseboards, outlets, and curtains. They leave behind tell-tale marker-like stains and smears after feeding that are brown in color. Bed bug infestations occur when a child or staff member transfers nymphs or adults into the facility from another infested location. Bed bugs may be introduced to your care center without developing into an infestation. However, if a female bed bug is introduced to your facility and she finds a host, she may lay eggs that then hatch. An infestation is likely to occur when this new generation feeds and mates. Frequent inspections for bed bugs are beneficial for a couple of reasons. First, bed bug inspections are critical for detecting an issue before it develops into a larger problem. Second, when you know your facility is free and clear of these troublesome pests, you, your staff, and parents will have the peace of mind needed to focus on caring for the children. A professional bed bug detection team can also provide you with tips on how to avoid infestations in the future. What measures will you take to inspect classrooms, and how frequently will this be done? What should staff members do upon sighting a bed bug? Which pest control company will you call for extermination if you discover bed bugs? How and when will you notify parents if there is a confirmed infestation? 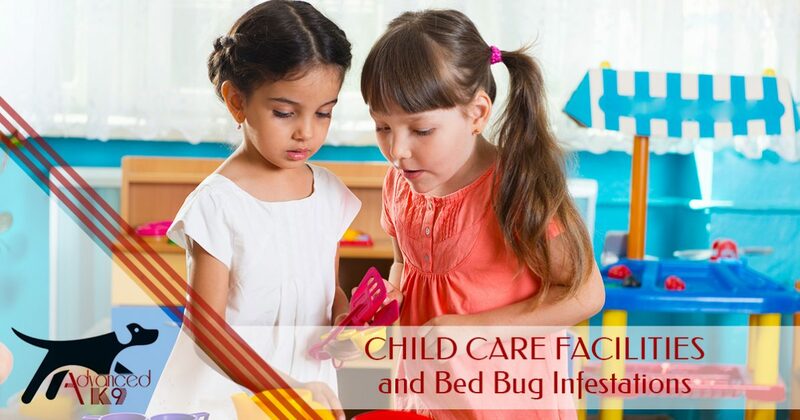 What will you do if the same child or student repeatedly introduces bed bugs to your facility? Having a plan in place ahead of time will ensure that you and your staff are prepared in the event that a bed bug infestation occurs. Whether you are concerned that bed bugs may have been introduced into your facility or you would like a proactive bed bug inspection to assure parents and staff that your facility is clear of these troublesome pests, our canine bed bug detection team can help. Our dog, Tracker, can detect active bed bug infestations more accurately than a human, providing you with fast, accurate bed bug detection. Contact our team today to get started!